Manolo says, here is the original director’s cut of the Manolo’s latest column. I’m a new teacher of middle and high school students, so I need comfortable yet fabulous and affordable shoes to go with dress pants and knee-length skirts. Manolo says, well the Manolo remembers from his own days of schooling the new teachers who would arrive the first day filled with the indomitable spirit of young idealism. Of the course, by the end of the month many had decided to take up less challenging occupations such as the professional wrestling. But, perhaps it will be easier for the young teacher to hold on to the idealism (and avoid the unsightly hammertoes and bunions of the elderly school marm) if she has the stylish and wearable shoes. Such as the Sidney from the Isaac Mizrahi. 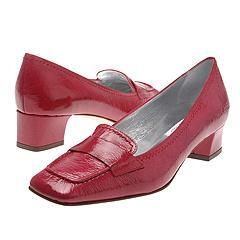 It is the traditional but attractive moccasin-toed pump that comes in the untraditional colors, such as this fuscia. Even the better they are on the sale at the Zappos, over 50% off! The Manolo he does not wish to complain, but the process of the newspaper editing, it takes some of the color out of the Manolo’s prose. This entry was posted on Thursday, August 25th, 2005 at 3:37 pm by Manolo the Shoeblogger and is filed under Doings of Manolo!, Shoes. You can follow any responses to this entry through the RSS 2.0 feed. Both comments and pings are currently closed. Thank you for answering my question! These are indeed fabulous shoes and when I get my first paycheck I will have to investigate further. I am very fond of the color, I have been wanting something in the red family that will be cheerful for after slogging through the Northeast winter slush. Indeed perfect for a teacher even in sunnier climes. Must now check how many other colors they come in. Thank you, Manolo! The Manolo might want to mention to his editors that he would like to retain more of his unique voice if at all possible. Sometimes, such a request can be accommodated. Other times, no. But it does not hurt to ask. I am a newspaper editor myself, and I love the Manolo’s voice and would leave it intact to the greatest possible degree. But, as Elvira notes, sometimes these changes just have to be made. Ayyyy! Fuschia! This it is the fault of the Manolo who has the reputation as the bad speller. Not to be a besserwisser, but the correct spelling for this elusive word is actually “fuchsia”. The English pronunciation makes it very hard to spell! Named after a German botanist named Leonhard Fuchs, apparently. Oh, and the shoes are very nice! I cannot help but say, what teacher can afford these shoes??? ?